At Hyegraph Invitations & Calligraphy our clients love our digital calligraphy service for wedding envelopes & guest addressing. Once your invitations are ready, it’s time to address your envelopes with your guests’ addresses. 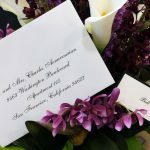 Whether you’re in the San Francisco Bay Area or outside of San Francisco, Napa, Oakland, San Jose or even in Southern California, San Diego, Beverly Hills, Malibu and nationwide in Seattle, Washington or Hawaii, I can address your wedding envelopes in 1-2 business days. Below is an example of Hyegraph’s Digital Calligraphy printed wedding envelopes with guest addressing. The above Wedding Envelope Guest Addressing is printed using Digital Calligraphy. The font style is Peoni Pro in Black Ink. The return address on the flap is also printed with the sender’s address in matching font style. Pick out & Email me your favorite font style for envelope addressing. Or pick from our guest addressing font styles. I can also match most invitation font styles. Email Me your guest addresses in an Excel or Word file or use the Hyegraph Guest Addressing Form. Pick out the ink color to match your invitations. 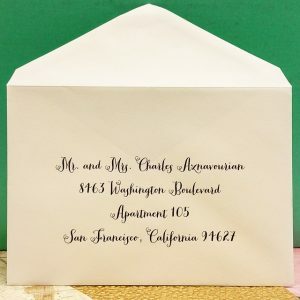 I can address your wedding envelopes with guest addressing in Black Ink, Colored Ink, or White Ink. That’s It! Once I’ve received your wedding envelopes and guest address list, I can proceed to address your envelopes in 1-2 business days. You can pick up your addressed wedding envelopes from Hyegraph or I can mail them to you. Prices for Guest Addressing for Wedding Envelopes in Black Ink is $1.00/per Envelope. Prices for Guest Addressing for Wedding Envelopes in Colored Ink, i.e. gold, grey, navy, mocha, maroon is $1.25/per Envelope. Prices for Guest Addressing for Wedding Envelopes in White Ink is $1.50/per Envelope. Please Call with questions or inquires to Jacques at (415) 626-0461 or Email Jacques at info@hyegraph.com. I’m here to HELP! 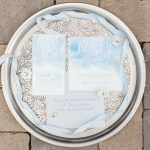 Hyegraph can also print your Wedding Invitations, Save the Dates, Wedding Response Card Envelopes, Place Cards, Menus, Programs or other Wedding Stationery. Check out our Hyegraph Blog for more design ideas. Please see our Testimonials, Yelp and Google for reviews. You can see our Digital Calligraphy Page for more Printing Ideas & Styles.